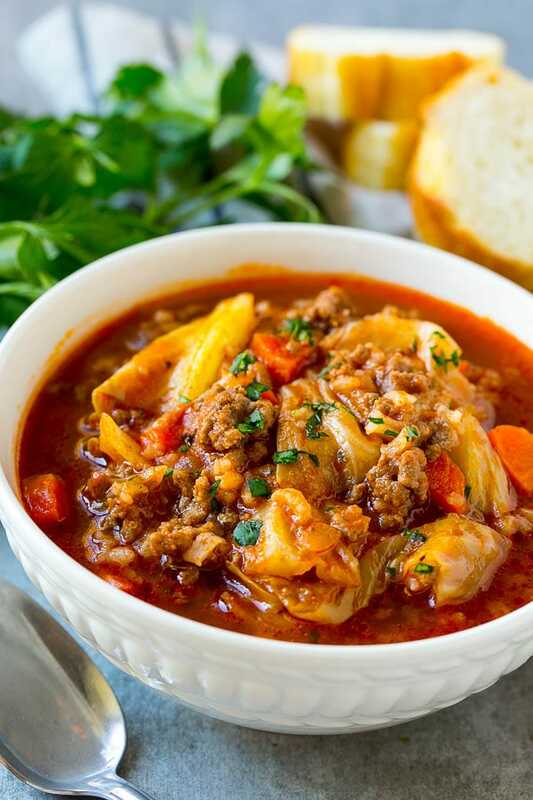 If you love cabbage rolls, but don’t love all the work involved, this quick cooking cabbage soup is for you! Baked cabbage rolls are one of those nostalgic dishes that my grandma used to make. While I love the flavors, I don’t love all the work involved. Between boiling the cabbage, making the filling, wrapping everything up and then the bake time, it can turn into an all day affair! This cabbage roll soup has all the same flavors as the classic dish, but with a fraction of the prep time. 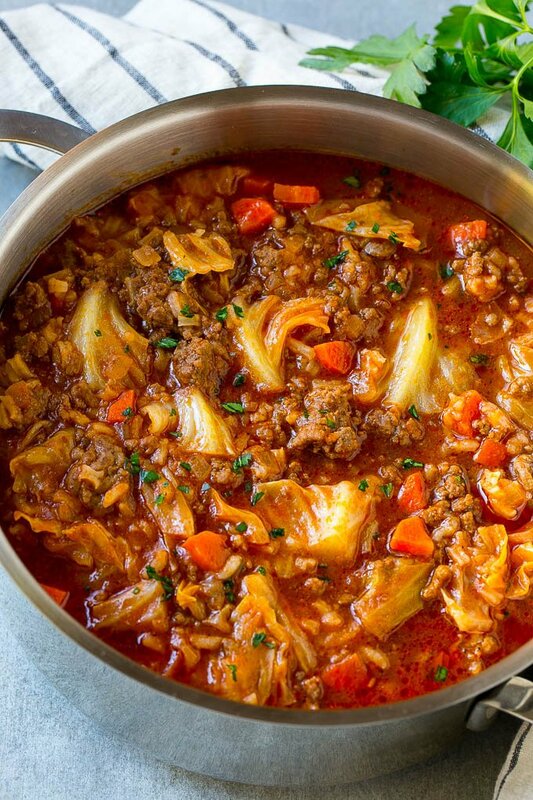 To make your unstuffed cabbage soup, you’ll need to start with some ground beef. I use 90% lean beef, it’s got great flavor but doesn’t make the soup overly greased. 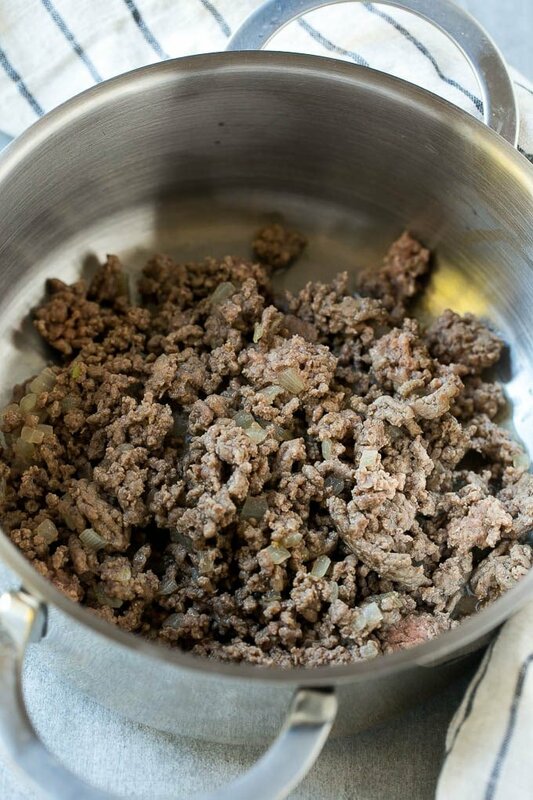 The beef is browned along with some onion before the rest of the ingredients get added to the pot. 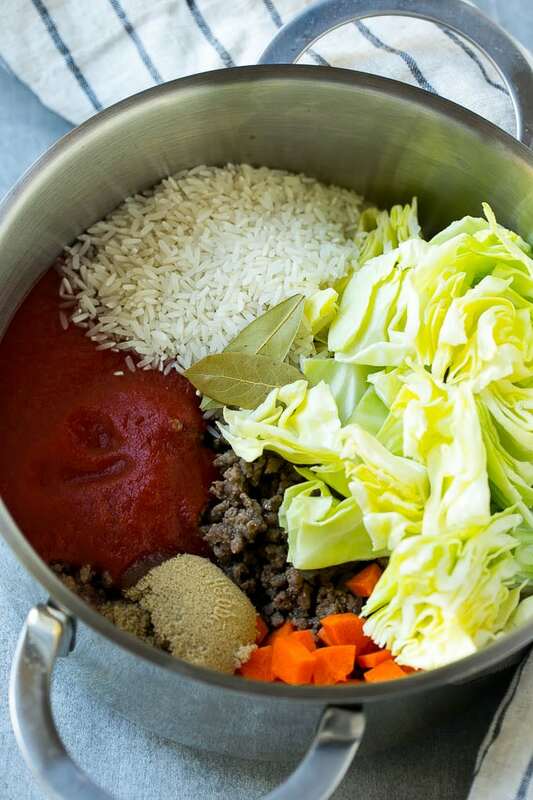 After your beef is ready to go, everything else goes into the pot, including rice, carrots, tomato, spices and of course, cabbage. Bring the whole thing to a simmer and in about 25 minutes dinner is done! What you end up with is a rich and hearty soup that has complex flavors. I know in many cases simmering a soup for longer helps to develop the flavors, but in this case you don’t want to over-cook the soup or else the rice will get mushy. There is so much going on here, between the meat, veggies and rice, that it’s really a complete meal in one pot. 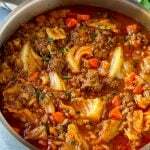 I do often serve this cabbage roll soup with a side of crusty bread or a green salad, just to round out the meal. Even my kids love this one, they didn’t even mind the cabbage pieces which normally they might not eat. I often make a double batch of this soup just so we have leftovers to eat for a few days, that’s how good it is! It’s absolutely perfect for a cold night, and the quick prep time makes it ideal for a busy weeknight. Recipe adapted from The Wholesome Dish. Not a fan of ground beef? Try ground turkey instead! You can substitute brown rice for white rice, but that will require about 20 more minutes of cook time. This is one of the BEST recipes I’ve tried! Savory and satisfying. I really wanted to make this soup today…a rainy, cool Sunday… Did not quite have all the ingredients so instead of rice, I used tiny pasta shells, which I precooked el dente and did not add them till the last ten minute… Used a can of pureed stewed tomatoes for one of the sauce and a half cup of original V8 juice… we all LOVED it !!! My family doesn’t like rice so I cubed potatoes small to bite size now they liked the taste that’s for this recipe. We have actually made this and used riced cauliflower and it was awesome. Glad to hear it worked well with cauliflower, thanks for reporting back! Could I use a 1/2 cup of barley instead of rice? That will work but barley typically takes longer to cook so you’ll need to simmer it for more time. Soundsgreat! As I am typing I just put this all together a d it’s simmering! I hope it turns out great and it looks! Thank you and I added diced tomatoes also. I live alone, so this recipe will go a long way and it sounds wonderful. I’ll be using my slow cooker and adding the uncooked rice last. How much cooking time will the rice need? Thank you! The rice should cook in about 30 minutes on high! What is the serving size. I changed it to 12 total servings, but how big is one serving? Made this vegan by using veggie crumble. Will be making this again!!! We will be trying this without carrots and sugar, and serving with sour cream on top. Oh, and adding lots of lemon juice when we do our cabbage rolls really perks up the flavor. I’m about to try the vegan version myself. So happy to hear it turned out well. Can’t wait to get this ready tonight!